Adult northern water snakes look all-dark but are usually patterned with bands that are wider than the spaces between them. Young snakes have brighter patterns. What snake is the second most likely one to be seen in Westborough and the surrounding area? The number 2 snake in town is the northern water snake (Nerodia sipedon). Its name tells you where you’ll find it. Look for these snakes at the edges of ponds, streams, and swamps. They bask in the sun on banks to warm up, or hunt there for their favorite food – small fish, frogs, tadpoles, and salamanders. Sometimes several water snakes bask together in the same area, especially in spring and fall when the weather is cool. You might also find one on a branch over water. Northern water snakes are good swimmers, so you might spot one in the water, swimming at the surface or underwater. People who fish or boat have a good chance of seeing one. Water snakes sometimes swim at the surface with their head poking down under the water as they look for prey. These snakes are active during the day, as well as at night. Northern water snakes can get fairly big – typically 2 to 3-1/2 feet long and several inches around. Females are usually larger than males, all the better to carry developing young. Do we have anything to fear from these snakes? In a word, no. Northern water snakes are not poisonous. Remember: Westborough has no poisonous snakes! Some people mistakenly think that northern water snakes are cottonmouths (also called water moccasins), but these venomous snakes are not found north of Virginia. 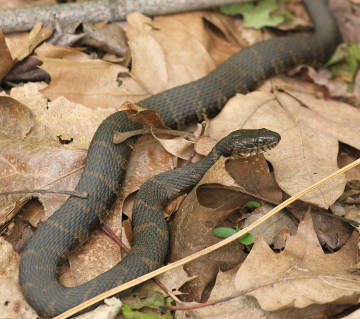 There is no reason to kill a northern water snake in Massachusetts. Like other wild animals, northern water snakes don’t appreciate being handled or cornered. If you make an attempt, these snakes will defend themselves vigorously by thrashing, biting hard, and spraying a foul-smelling liquid. What do northern water snakes look like? Their appearance varies. Adults usually look dark – gray, brown, or black – with a light underside. They are usually patterned with bands that are wider than the spaces between them (as in our photos), but the pattern can be hard to see. Their underside has small orange or black half-moons (notice the orange markings in our close-up photo). Younger snakes have brighter, more noticeable patterning. It’s also easier to see the patterns when the snakes are in the water. Like all snakes, northern water snakes are covered with scales (and aren’t slimy). They even have clear scales on their eyes (but no eyelids, so they don’t blink). A northern water snake’s body looks rough, rather than smooth, because its body scales have a ridge (called a keel, perhaps because it looks like the keel of a boat) in the center. You might find an empty snake skin near water because, like other snakes, northern water snakes shed their “old” skin from time to time to uncover a new one as they grow larger. Life near water brings mosquitoes, even for this northern water snake. How do our northern water snakes survive the winter? They are “cold-blooded,” which means they don’t generate body heat to keep themselves at a certain temperature the way we do. Around this time of year, as our October warm spells disappear, northern water snakes also disappear. They typically overwinter underwater or in the mud at the bottom of a pond (as do painted turtles, snapping turtles, bullfrogs, and green frogs). Water holds heat better than air, and when ice forms at the surface of a pond, it protects the water and creatures below it from extreme cold. Sometimes a northern water snake will move into a beaver lodge or muskrat lodge for the winter. When northern water snakes re-emerge in the spring, usually in April, it will soon be their mating season, especially in May-June. More than one male may try to court and mate with a female at the same time. You might see smaller males rubbing against or coiling around a larger female, either on land or in the water. Like some other snakes, water snakes give birth to live young. (Many other snakes lay eggs.) In late summer – August and September – females typically give birth, one at time, to 1-5 dozen young. The larger the female, the more young she can bear. Newborn water snakes are about 6-12 inches long, with bright patterning. The female may stay with the young for a few days but does not really provide any parental care. The baby snakes have to fend for themselves from the start. Young or old, water snakes are prey for other animals. They especially risk becoming bird food for herons, egrets, hawks, owls, and gulls, but songbirds can take young snakes. Their other predators include snapping turtles, raccoons, skunks, and foxes. How do water snakes avoid falling victim to these predators? Mainly they rely on camouflage. Their dark, banded or blotchy appearance helps them blend into their surroundings on land and in water. They don’t have ears, but they can sense vibrations made by predators and either lie still or move away. Northern water snakes hunt by sight and smell. They have good vision, both in front and to the side. Like other snakes, they pick up scents with their tongue. When northern water snakes catch something to eat, they swallow it whole. How can they do this? Their lower jaws are very flexible and loosely attached to their skull, permitting them to open their mouths very wide. 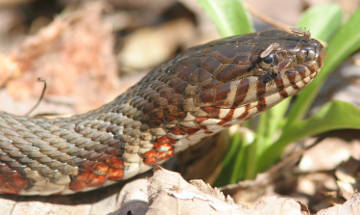 Besides fish and amphibians, northern water snakes occasionally take birds (such as baby ducks), mammals (such as mice and chipmunks), and insects. Because the bodies of northern water snakes and others are long and tube-like, their internal organs are arranged somewhat differently from ours. Snakes basically have only one lung (the right one), and other pairs of organs such as kidneys are lined up one after the other, instead of side by side. As the season for snakes winds down, let’s look forward to seeing them again in the spring. And remember to treat snakes and all wildlife with respect.